Our farmer’s market season ended the day before Thanksgiving. We have a mild climate here in Oregon, but don’t kid yourself: an outdoor farmer’s market in November can be challenging! One market was canceled due to high winds. We’ve had some heavy rains, with 3.5 inches of rain falling on Thanksgiving day alone! This flooded our back pasture, and the hens there were wading through a couple of inches of slow-moving water for a day or two. They weren’t enthusiastic about this, but they didn’t panic, either. Things are now back to normal. 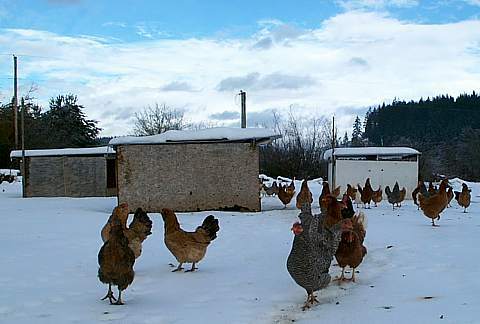 One of the things that’s part of the package when you do old-fashioned free range is that weather matters more than it does with confined chickens. Now that it’s December, the weather is turning cold right on cue, with snow in the forecast for the first time today. One of the inventors of the modern Christmas tree, Hal Schudel, lived a mile or so up the road from us. He introduced all sorts of innovations, including hauling out the trees by helicopter to eliminate the need for roads and their attendant erosion, and the introduction of the Noble Fir as a premium Christmas Tree. Hal, who was once an agronomy professor at Oregon State University, knew a good tree when he saw it! He also figured out how to raise them sustainably in bulk and help many farmers make a living from them. He passed away two years ago at the age of 96. In case no one told you, Christmas is coming! (No, really! It is!) And I can’t think of a better gift than a book from Norton Creek Press! Unless it’s more than one book from Norton Creek Press. There’s still time to get my paperback books in time for Christmas, except a couple (Turkey Management and Poultry Production) that list longish shipping delays on Amazon and probably elsewhere. My ever-increasing list of Kindle editions, being electronic, can be downloaded immediately. Kindle books can be read on almost anything with a screen these days: computers, tablets, smartphones: you name it. You can even read them on a Kindle! Giving Kindle Books. Did you know that you can give a Kindle e-book as a gift? Even as a seriously last-minute gift? Just follow these instructions. Genetics in Practice: Expert Techniques for Successful Chicken Breeding, by F. B. Hutt. (Kindle only.) For years, I’ve been telling people that it was worth buying Genetics of the Fowl ($44.95) for the “Genetics in Practice” chapter alone. And it’s true! It converts all the genetic theory in the other 500 pages of the book into practical, actionable concepts. I’ve created a separate Kindle book to feature this important section for $9.99. It has everything, including how to eliminate unwanted characteristics and fix desired ones, when to use ordinary selection, when to use progeny testing, how to do rapid progeny testing without the need for vast numbers of chickens, the use of inbred strains, strain crosses, and breed crosses. Genetics in Practice is a must for every serious chicken breeder. The Dollar Hen: The Classic Guide to American Free-Range Egg Farming. (Kindle and paperback.) Milo M. Hasting’s fascinating and surprisingly practical 1909 chicken book is now available on Kindle for just $5.97. It’s a Woman’s World: A Bouyant Guide to Easier, More Enjoyable Living by Ruth Stout. (Kindle only.) This little-known book by Ruth Stout, everyone’s favorite eccentric, is … well, the title pretty much says it all. If you liked Gardening Without Work, you’ll like this one, too! Through Dungeons Deep: A Fantasy Gamers’ Handbook by Robert Plamondon. (Kindle and paperback.) My guide to playing role-playing games like Dungeons & Dragons, written when I was in college, is available on Kindle for just $4.97. Ten Acres Enough (Norton Creek Back to the Land Adventures, Vol. 1) by Edmund Morris. We Wanted a Farm (Norton Creek Back to the Land Adventures, Vol. 2) by M. G. Kains, author of Five Acres and Independence. Gold in the Grass (Norton Creek Back to the Land Adventures, Vol. 3) by Margaret Leatherbarrow. Win a Free Copy of Success With Baby Chicks! Back when we were just starting out, beginner’s luck ensured that our first batch of baby chicks did very well, but after that things became erratic. At the time, there were no books that spent more than a few pages on caring for baby chicks. So I did what I always do: I immersed myself in the literature, especially the poultry books and experiment station bulletins from 50-100 years ago, before high-density confinement methods started monopolizing the attention of poultry scientists. This revealed a wealth of hard-to-find information about raising baby chicks. We tested an enormous number of techniques. We discarded the ones that didn’t work and repeated the ones that did. After a few years, our results became consistently good. What were we doing to ensure our success? I wrote all this up in my book, Success With Baby Chicks, the only book devoted solely to the brooding period. One thing’s for sure: we weren’t solving the brooding problem by throwing money at it. All our methods are simple, inexpensive, and not even very time-consuming. And if you don’t win, it’s still worth your while to buy your own copy of Success With Baby Chicks, available in Kindle and paperback editions. December weather tends to go from bad to worse, with freezing and power outages to keep things interesting. (See one of my blog posts about winter experiences with free-range birds in open housing.) On the other hand, most people don’t have any baby chicks in the brooder house in December, and adult chickens are relatively tough, so December is something of a low-stakes gamble. Later in the winter, though, people start brooding their early chicks, so the stakes get higher. If you want to have pullets laying well by the start of a traditional Farmer’s Market season (Memorial Day), you need chicks in January. If you hatch your own eggs, that means incubating eggs in December. Wait, wasn’t winter supposed to be the slow season? Not to mention that the hatchery catalogs will start arriving right after Christmas, with special low prices on early chicks. As soon as you’ve cleared away the remains of the New Year’s party, you’ll be on fire to start the new season! Do final winterizing before things get really nasty. Stake down portable houses so they don’t blow away! Get the equipment and coops you don’t use in the winter put away. Remove the tarps from tarp-covered range shelters to ensure they don’t collapse under snow loads. Ensure plenty of liquid water for your chickens in cold weather: keep it from freezing. Warm water is better than cold if you can manage it easily. Give your chickens as much feed as they want. Winter is no time to save money on feed! Keeping warm requires lots of calories. Use artificial lights to maintain the rate of lay and to give the chickens enough light to eat by on those short, dark winter days. Remove wet or caked litter. If you use the deep litter system, toss it into a corner, where it will heat enough to dry out and decake itself in a few days. Clean out brooder houses and make ready for early chicks. Sign up for farming conferences in your area. Sit in front of the fire and read poultry books.